A notable part of the international boundary between the United States and Canada. 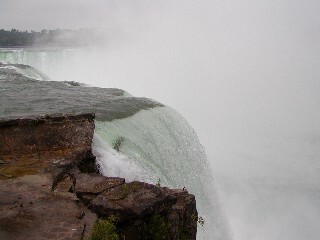 Niagara Falls is actually three falls. 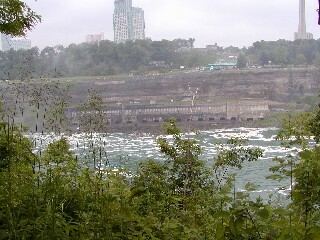 'The Canadian Falls are a Horseshoe shape 158 ft (48 m) high and 3010 ft (917 m) at the crest. 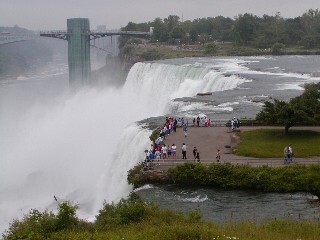 The American Falls and Bridal Veil Falls are 167 ft (51 m) high and 1060 ft (323 m) wide. 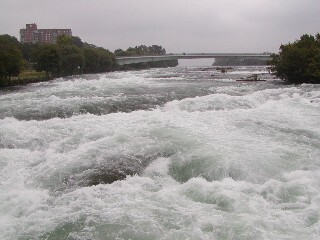 Cities on each side of the falls have over 70,000 population and tourism is the mainstay of both cities. The view from either side is spectacular. 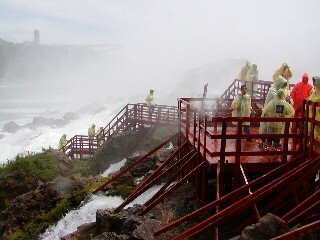 Take a tour on a boat that goes into the mist at the base of the falls or hoof it on the walks from parking lots. The land north of the Great Lakes was lost to England in the French-Indian War of 1812. No great loss said the French about the vast acres of ice the fur trappers called Ontario. that line the Niagara gorge below the falls. granite rocks to allow viewing at the base of Bridal Veil . The mist is penetrating but slickers are provided. 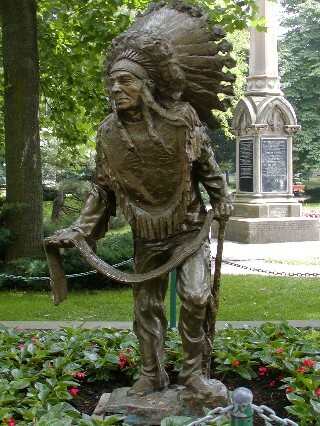 History lives in the statue of a great Iroquois Chief with wampum. Algonquin, a French word used in 1666, literally means real adders. Cherokee, Erie, Cayuga, Mohawk, Oneida, Onondaga, Seneca, and Tuscarora peoples.